If you have a 64drive and a transfer pak, you can dump Game Boy ROMs and saves straight to microSD. Neat party trick: dump the images from your Gameboy Camera. BIG FAT WARNING #1: CF is not supported. If you use this with a CF don't be sad when it destroys your file system. BIG FAT WARNING #2: This software is beta-quality. Don't use it with a microSD you really care about. In fact you should probably run chkdsk on your card every time you use this just in case. Pretty simple: plug in transfer pak with game, turn on 64drive, launch agbd.z64. You can dump the ROM and SRAM (on carts that have SRAM). The files will be created in the root of the microSD. They are named after the game's title (from the ROM header). 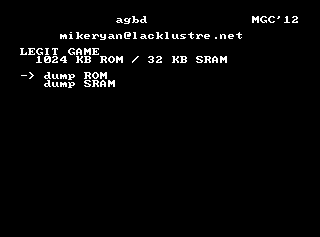 ROMs are named .gb and SRAM is .sav. If you get errors: turn the console off, blow on the cart and try again. If you get "no tpak", turn the console off and reseat the transfer pak. I've tried this with the handful of carts I have lying around. It should support any combo of ROM and RAM you come across, but email me if you run into any snags. The transfer pak is pretty dang unreliable. Half the time it doesn't work and when it does you're liable to get data corruption. There's no way to improve that, sheet's broke by design. Sorry! this tool of unknown origin (Windows only :().